There are hundreds of variable rules which can affect the ideal strategy in any given version of 21. We’ll show you how to get the best odds on your favourite online blackjack games through basic strategy, highlighting how certain conditions can alter the way you should play a hand. Unlike baccarat, roulette, or the pokies, real money blackjack is a game where players can use skill and strategy to improve their likelihood of winning. By knowing when to hit, stand, split and double down, you can limit the house edge and give yourself the best possible chance to beat the dealer. 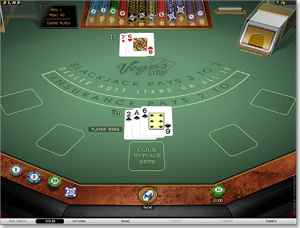 The most common method for good blackjack play is known as basic strategy. This is a fixed set of moves which covers every conceivable situation in a hand of 21, taking into account key factors such as the value of the player’s hand, the rank of the dealer’s up card and the number of decks in the shoe. 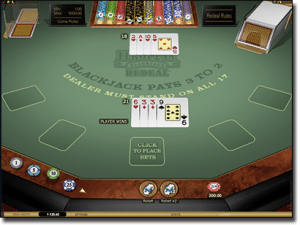 The simplest way to learn blackjack strategy is to use a chart which lists the appropriate action for each combination of player hand and dealer card. These are easy to find – a quick image search in your Internet browser will turn up thousands of results for all different kinds of 21 games. Strategy charts are usually separated into three parts: hard hands, soft hands and pairs. Each table features an axis which lists all the possible player hands, and another which covers each of the 10 up-card values a dealer might draw. Compare your hand against the dealer’s to find the best move for that situation. For example, let’s say we are playing a standard American blackjack game. We draw a Six and an Eight for 14 points, while the dealer is showing a Five. If we look at the section for hard hands on a basic strategy chart and follow the row for 14-point hands to where it intersects with the column for a dealer Five, it will tell us we should stand. Our top-ranked online casino sites offer myriad variants of real money 21. Vegas blackjack, European-style games, Spanish 21, live dealer tables – there’s something for everybody. Every different type of blackjack game requires its own set of basic strategy charts. If one game allows doubling down after splits (DAS) and another doesn’t, for instance, there will be a difference in how you should play certain pairs. The same goes when it comes to hole card rules (peek or no peek), whether the dealer hits or stands on a soft 17, the number of decks in play and whether or not late surrender is allowed. To demonstrate how the presence or absence of certain rules can affect the way you should play, we’ve drawn up some strategy charts for two of Microgaming’s most popular online 21 games: the European-style Classic Blackjack Gold Series and the American-style Vegas Strip Blackjack. Note the discrepancies for splitting, in particular. There are a few things you should always do when playing real cash blackjack games, and some things you should avoid at all costs. Here are a few quick tips to keep you in line for just about every variant of 21. Split Aces – This is the golden rule. Splitting a pair of Aces gives you two shots at drawing 21, which is about as good as it gets. Some say you shouldn’t split them against a dealer Ace in European blackjack games where the house takes no hole card, but many experienced players do so anyway. Stand on a hard 17 – While there might be one or two exceptions where more complex blackjack techniques are concerned, the vast majority of basic strategy charts ask you to stay put on any hard hand of 17 points or more. Split Eights – This old saying goes for most American blackjack games where the dealer peeks for blackjack. In Euro-style games, the convention is to hit against a 10 or Ace and split in every other circumstance. Split Fives – A hard 10 is a solid base from which to hit or double down, so why would you break up such a hand? If you split a brace of Fives, the best you can do on either new hand is 16 – a very awkward total. Split 10s – This is even more of a no-brainer. Two 10-point cards gives you 20, meaning the dealer can only beat you by drawing the best possible score. Double down against an Ace – The only time you should ever even consider doubling against 11 is when the dealer is allowed to hit a soft 17. Otherwise, don’t even think about it. Take insurance – The 2 to 1 payout looks tasty, but don’t be fooled. Like all side bets, the insurance option hikes up the house edge and thus counteracts any advantage gained by learning basic strategy. The best gambling strategy of all is to pick the right games. While VIP rooms at land-based Australian casinos might offer some value to high-stakes blackjack players, the standard tables for the rest of us rank-and-file punters are nowhere near as accommodating. We understand that modern-day gaming venues need to look after their profit margins, but the ever-rising house edge on 21 is doing nothing to attract business. It’s a very different story when you gamble online. As Internet casinos don’t have the same overhead expenses as brick-and-mortar betting houses, they can afford to maintain a more diverse and player-friendly range of AUD blackjack games. You can find Vegas-style games, single-deck blackjack, Spanish 21, English pontoon, Double Exposure, live dealer games and more without having to so much as leave your chair. Flexibility is another advantage. The sites we recommend all run instant play casino interfaces which require no downloads and are compatible with Windows PC, Mac OS and most other desktop operating systems. They also support mobile blackjack on smartphone and tablet devices, so you can play wherever and whenever you like. Best of all, however, is the value for money. Each of our approved blackjack sites offers titles with a house edge of less than 0.50 per cent, with some going as low as 0.09 per cent with perfect strategy. Good luck finding that kind of bang for your buck at Crown Casino, The Star, or any other b&m gambling venue. Get the best odds online at G’day Casino – our number one Australian blackjack casino.